Jan for Make It & Love It elevated a short secondhand bookcase visually and literally by adding a set of legs. 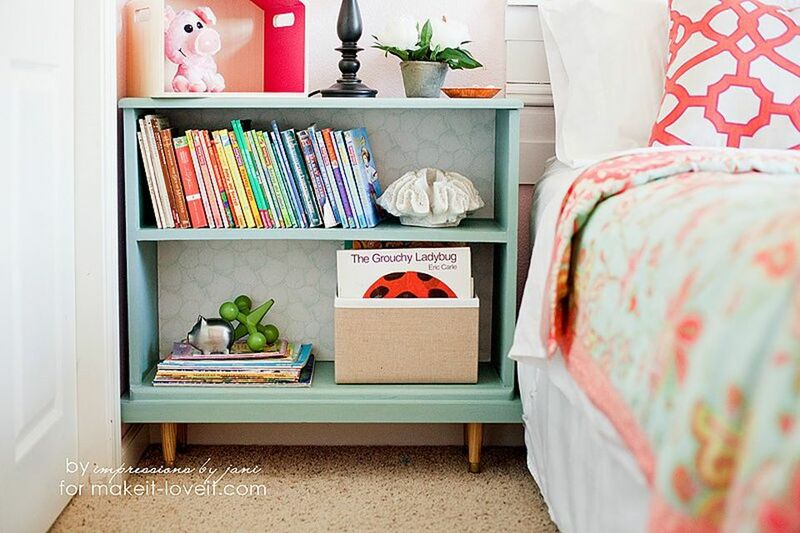 Placed beside the bed, it does double duty as both a bookshelf and an alternative nightstand. The tapered legs with metal tips give this bookcase a Mid-Century Modern look. Use bun feet instead if you prefer cottage style. Or, opt for chunky square feet for a contemporary or transitional feel. This thrift store bookcase was dark and dated when Confessions of a Serial Do-it-Yourselfer's Christy spotted it. She took it home and gave it a coastal-inspired makeover with paint. She started with a beachy blue enamel and then used her own recipe to turn it into chalk-finish paint. Before painting or staining, make a plain bookshelf prettier by attaching a decorative applique. The finished look resembles carving. For this dreamy makeover, Jen from Rustique Restoration cut a custom wood valance to back her appliqué. After attaching both, she finished the bookcase in a distressed creamy white. To add raised decoration to a larger surface, such as the bookcase sides, opt for furniture overlays instead. There's no rule that says you can only use one color on a painted bookcase. Chicken Scratch NY's Alecia opted for a barn red bookcase with mustard yellow shelves. The result is vibrant and cheerful—and the burlap back adds a rustic touch. Painting the back wall of your bookshelf draws attention to the objects inside. It's also a smart way to incorporate a color that's too bright or bold to use on the entire piece. Crafts by Courtney showcased a striking makeover featuring bright bookcase back walls. Courtney replaced the original backs with beadboard and painted them a minty blue-green. You're not limited to a solid color when you paint the back walls of a bookshelf. Just ask Centsational Girl's Kate, who sponge painted a pattern onto hers. Though the design looks like cheetah spots, she executed it in a crisp blue on white. You don't need a steady hand to paint a pattern on the back of your bookshelf. Stencil it instead. Lolly Jane's Kelli stenciled a stunning herringbone design onto the back wall of her craft room bookshelves. Vintage suitcases, old crates, and handmade bunting complete the look. With its new top, base molding, and intense green paint, you'd never know this bookcase by Erin Spain started out as an IKEA Billy. However, it's the wallpapered back that really makes the piece special. Erin chose a scenic wallpaper with an unusually large repeat (the repeat is the pattern's scale) that spans the entire back. Though less dramatic, small- and medium-scale patterns also look good. Since the back panel of a single bookcase is fairly small, it's a fantastic place to use vintage wallpaper scraps. No wallpaper on hand and you don't want to invest in an entire roll? No problem. Cover the back wall of the bookcase with patterned fabric. My Third True Love's Ali (now the creative force behind pop-up shop The Garage Collective) spotted this small bookcase at a flea market. She painted it white and added a fun floral fabric to the back. It went from Early American yuck to cottage charmer. A fabric-backed bookcase doesn't have to be busy. You can also use fabric to add texture. Driven by Decor's Kris used upholstery tacks to attach burlap to the backs of her living room bookcases. The effect is casually elegant. For a similar textured look, you can also use grasscloth wallpaper. As lovely as chalkboard paint looks on furniture makeovers, its matte finish doesn't reflect light. That means the shadowy interiors of bookshelves seem even darker if you paint them with a medium or deep shade. On this charming blue-gray bookcase makeover, Jennifer Zuri for Jennifer Rizzo Design Company solved the problem by painting the interior in a soft white. Both books and accessories show up beautifully. Designers Traci Zeller and Lisa Mende transformed this showhouse shelving unit with sumptuous charcoal velvet and a smart menswear plaid. The nailhead trim edging the shelves completes this modern masculine look. Confessions of a Serial Do-it-Yourselfer's Christy completely replaced the boring back of this thrift store bookshelf. She repurposed fence pickets, a free curbside find, for the new back. After sawing the pickets to size and color washing them, she installed them horizontally for a shiplap-like effect. If you don't have any fence pickets on hand, get a similar look using pallet planks or horizontally installed beadboard. Fine furniture is usually finished with as much trim and molding as the style allows. Thus, you can make a cheap bookcase look more expensive by adding molding—even if it starts out as a plain laminate piece. Kate from Centsational Girl made a pair of IKEA Billy bookcases unrecognizable by installing base and crown molding. She also added lattice trim to make the sides and shelf fronts appear thicker. If an antique bookcase isn't in the budget, you can age the finish a newer piece for an antique or vintage look. Before repurposing this wooden bookcase for kitchen display, Melissa from Polka Dot Chair painted it white and stenciled the back with a design. Then, she sanded both ends for a distressed vintage effect. When Here Comes the Sun's Kelly updated this flea market bookcase for use in her son's room, she didn't just do a cosmetic makeover. She also gave him a space to create by spraying the side with chalkboard paint. A bookcase with chalkboard sides could also come in handy in a kitchen or craft room. Simply Beautiful by Angela showcased a bookcase transformed with a thick new top made of planks. Angela also beefed up the overall look with real wood trim on the front and sides. You'd never know this sturdy beauty started out a flimsy laminate piece. In this remarkable makeover, Serena from Thrift Diving updated an old schoolroom bookcase for her sons' playroom. However, she did far more than just paint. She also added a custom storage space for Legos® with a handy lift-up top. Before painting this bookcase in a cheery cherry red, Karen from Redoux Interiors built a new top, added base trim, and installed a set of casters. Casters are furniture wheels. They add visual interest—and they make it easy to move the bookcase from place to place. At Simply Designing with Ashley, a bare-bones bookcase became an incredible industrial-inspired cabinet with casters and closing doors. To build the doors, Ashley encased acrylic panels in hand-built wooden frames. In this easy IKEA hack, Sugar & Cloth's Ashley turned a short shelving unit into a DIY bar cart by adding casters to the bottom and handles to the top. Already have a bar cart? Follow Ashley's instructions to transform your bookcase into a coffee station for the kitchen or a craft room cart. In this bookcase makeover, Addicted 2 DIY's Katie transformed a basic laminate bookshelf into a custom built-in the half wall in her den. She also built and attached a matching bench, which turned this once-boring bookcase into a cozy reading nook. You don't have to use your bookcase just for books. You can always repurpose it for other storage needs in your home. Crafty Nest's Monica turned a plain pine bookshelf into a charming china hutch. She increased the height by building a custom base with legs. A painted beadboard back adds the perfect finishing touch. Shelly from The Domestic Heart repurposed a $10 chest of drawers as a bookcase. She also installed a slide-out shelf so the new bookcase doubles as a desk. She finished the piece with painted stripes inspired by the designs on old grain sacks. You're not limited to a single project for your bookshelf makeover. DIY Passion's Erin and Dan mixed multiple ideas with great success on this thrift store bookcase. They refinished the wood on the exterior to make it lighter, painted the interior, and then stenciled the back wall with a design.